Chester's story and picture were sent in by Jim Logan, husband of the owner Ethel Beun. 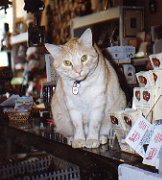 Here's what Jim has to say about Chester: "Chester is the the guiding light at The Unique Shop in Alexandria VA. 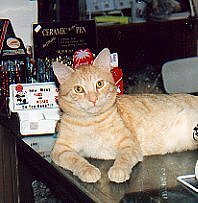 He's a rescue cat that came to the store from the Albert Foundation in 1992 when he was about 1 year old. Chester's workday starts early when the morning walkers in the Old Town historic district tap on the window and feed him through the mail slot. His store is in a restaurant district, so he works late into the night. During the night shift, he's been known to initiate first-time visitors by reaching outside the mailslot to attract attention. 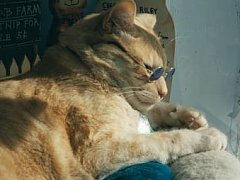 He has his own clientele who come into the store just to visit him, and he's exchanged photographs with the cats of visitors from as far away as Japan. Chester loves canine visitors--probably because he knows that's the way to win the hearts of those on the other end of the leash who sometimes have treats in their pockets." Note: Chester passed away in April of 2004 from cancer. He will be missed terribly.